It’s not everyday that you can say that you have written a book, but for me today, is one of those days. Thanks to the online publishing website www.lulu.com I was able to convert some of my blog posts, articles and other pieces of writing into a published book. 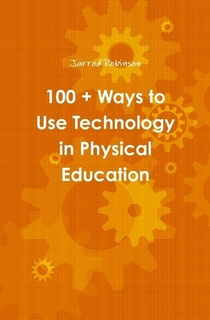 The book is titled ‘100+ ways to use technology in Physical Education’ and is a compilation of articles and ideas which have yet to be published on this blog, as well as some of my favorite blog posts throughout the last 3 years of posting. The book is available below. You can also visit my author spotlight . The reason I decided to turn parts of this blog into a book, is that I thought it could be a useful tool for teachers around the world who are looking for simple ways to incorporate emerging technologies into their classrooms. The benefit of providing it in book form is all of the ideas are jam packed in over the 34 pages. Making it a simple one stop shop and companion for this website. If you do happen to grab a copy, let me know what you think by leaving a review in the comments or on the lulu website. So do you have a book in you? Why not publish it with lulu? Thanks for introducing this book tho us I think this will be a great help on my P.E lesson. Thanks for introducing this book to us I think this will be a great help on my P.E lesson. Thanks heaps for the kind words. Hope you find it useful. My name is Kristie George. I am a student at the University of South Alabama. I am enrolled in the EDM 310 class. It is good to know that you have incorporated technology in the classroom and sharing a book with others about doing the same. I believe that this book will be very helpful. Hi Jarrod, did you get my post earlier this week about the webinar on April 21? Also, as you know,I downloaded your book. Is it ok if we give it a cover? I’ll also want to purchase and print a bundle for April 21 – is that ok? Hey my name is Kristy, I am student at the University of South Alabama. Your blog has been very beneficial for me as a future PE teacher. Thanks for opening my eyes up to this amazing book.